is a perfect furniture piece for people who have longed for traditional interiors. This astonishing model features truly classic, timeless design, and can easily fit into the variety of interior setting. However, a traditional dining room is the place where Freda Dining Chair In Floral Fabric will truly shine. is that this is one of the sleekest looking models that features a very unobtrusive design at the same time. Unobtrusive grey and lime floral print on a truly timeless, classic white background fits into any dining room style and can become a fantastic addition to any interior colour palette. — genuine wood, oak especially, give any dining room a warm and inviting look. Simply perfect in combination with natural oak table, Freda Dining Chair In Floral Fabric will give any dining room a timeless, classic look. However, Freda Dining Chair neutral design makes it possible to integrate the piece into mixed style and even modern interiors. Due to its elegant colours and a modest, unobtrusive print, Freda Dining Chair In Floral Fabric with oak legs will help you turn any dining room into the work of art. a sleeker, time-relevant look. The chair is incredibly comfortable to lean back into, offering you a chance to relax after a long day at work and enjoy delicious meals in the closest circle of family and friends. Genuine oak legs are equipped with a floor protecting system, which helps to avoid scratches even when you move your furniture. High load support, durable build, and finest quality fabric are only some of the most important quality criteria from this time proven furniture manufacturer. This piece of furniture is designed to serve you flawlessly for a very long time, staying good as new years after the purchase. 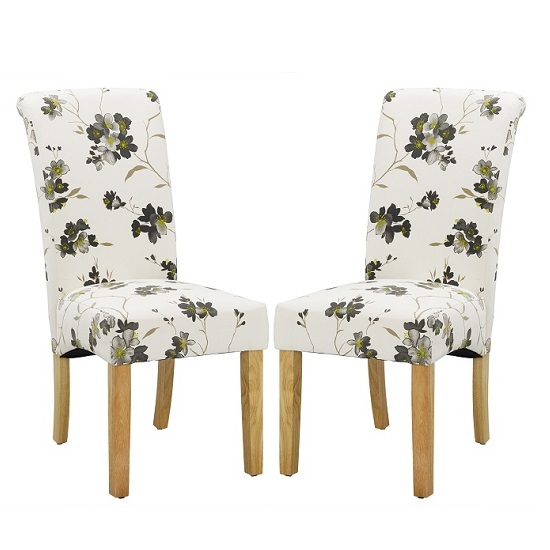 Moreover, Freda Dining Chair In Floral Fabric with oak legs is not one piece, but two. Each set includes two identical, high quality dining chairs at a highly reasonable cost. Just £169.95 for each pair will give you a chance to furnish even the largest of dining rooms without blowing the budget. And, if you start furnishing from scratch, sneak a quick peek at the selection of manually processed genuine oak dining tables — they will bring more luxury into your dining room interior, making the environment truly complete.